This morning, at 9 a.m. Eastern time, an event took place in Washington, D.C., focusing on one of the most amazing record sets ever to be created in the history of the United States. 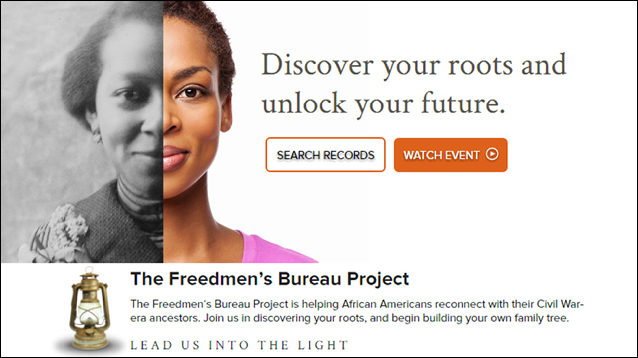 This morning, at 9 a.m. Eastern time, at the Smithsonian National Museum of African American History and Culture, the completed index to the records of the Freedmen’s Bureau was presented by representatives of the indexing project, led by FamilySearch. And, now, officially, that index belongs collectively to the people of the United States. The presentation was keynoted by Thom Reed of FamilySearch, who spoke of the indexing project, an effort by 25,550 volunteers to index and arbitrate nearly 1.8 million records. The records themselves are digitized and available online at DiscoverFreedmen.org, made available by FamilySearch, the National Archives, the Smithsonian National Museum of African American History and Culture, the Afro-American Historical & Genealogical Society and the California African American Museum. And now, for anyone who — like The Legal Genealogist — had ancestors anywhere south of the Mason-Dixon line after the Civil War, with the help of the index we can hope to find our families by delving into these records. There’s no way to overstate the value of the records of the Bureau of Refugees, Freedmen, and Abandoned Lands — an agency that because known as the Freedmen’s Bureau. It’s a record set extends far beyond its name to just about anyone who lived or worked in the south in those years right after the Civil War. First and foremost, for descendants of all the slaves and all the slaveowners who struggled to redefine themselves, their lives and their communities after the war. Sound good? That’s why heading to DiscoverFreedmen.org is one of the best decisions any southern researcher will make. And it is, today, so much easier to access these records, thanks to this indexing effort. But the task isn’t over. At today’s presentation of the index, Smithsonian representatives reminded everyone that the Smithsonian has a transcription project to create an every-word-searchable transcription to make the records even more useful. You can get more information at the Smithsonian Digital Transcription Center and more information generally at the website of the Smithsonian National Museum of African American History and Culture. I recommend “A Union Officer in the Reconstruction” by John William De Forest, first published by Yale University Press in 1948. It was available in paperback from Louisiana State University Press, published 1997 by arrangement with Yale University Press. De Forest writes of his time in Greenville County, South Carolina, and provides an insightful perspective on the successes and difficulties immediately post war. Since Greenville County is my home, I found it particularly interesting, but I think it would prove useful to anyone who is interested in this time period. The search provision at the link is a name-search for FamilySearch.org, not a search through the United States, Freedmen’s Bureau databases. If one looks at the FamilySearch.org “United States, Freedmen’s Bureau” databases, one finds that some of the “United States, Freedmen’s Bureau” databases are not indexed; images are on the site as browse-only. This is confusing. There is no way even to search all of the already-indexed “United States, Freedmen’s Bureau” databases which *are* indexed all at once. The index at DiscoverFreedmen.org is to the records, which happen to be housed on the FamilySearch servers. But you can search any name at DiscoverFreedmen.org. The search provision at DiscoverFreedmen.org is to all of the indexed Historical Records at FamilySearch.org. This does not include the unindexed Freedmen’s Bureau ~records~. I’ve not fully explored all the records, but have found labor contracts in Mississippi!